Have you ever heard the saying ‘take the high road’? It means to choose to do the right thing, even when it is not popular or easy. And it is one that epitomises what should be the way of the follower of Christ at all times. The Message Bible translation of this passage really drives it home. Easier said than done, I know. 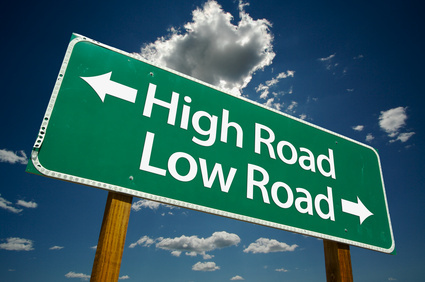 But to live above is to choose to take the high road every time. When that driver cuts in front of you and you almost hit another car trying to avoid him, you could choose to wind down your window and hurl insults at him; that’s the normal thing to do. Or you could choose to thank God that you didn’t hit anyone and let it slide. When your subordinate at work saucy comebacks get on your very last nerve, you could choose to give her a piece of your mind, or you could decide to take the high road, ignore her rudeness and patiently explain to her that your corrections are for the sake of the job and nothing personal. Now here’s a classic example. Someone you’re in the same department with in church offends you over and over. You could choose to hold a grudge against the person or even give the same treatment right back. But no, that would be a resort to carnality – the low life. We are each and all of us daily faced with numerous opportunities to allow our flesh get the better of us and react, retort, retaliate, hit back etc. But God’s point of view is that you always choose to take the high road, and your desire to will see His grace enable you every time.